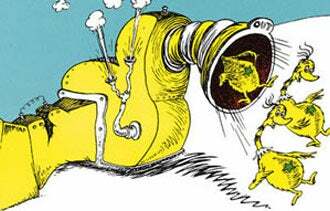 Sometimes when I hear companies talking about creating a "machine" for their lead-generation efforts, I think about Dr. Seuss. Specifically, I think about all the fantastical and imaginative machines he created in his 46 children's books--like the Super-Axe-Hacker, the Utterly Sputter and (my favorite) the Eight-Nozzled Elephant-Toted Boom Blitz, a mighty machine that rapidly fires explosive sour-cherry stones. Of course in real life, businesses can't flip the switch on a Triple-Sling Jigger to instantly produce prospects. But what if you could create a kind of machine for lead generation on your own company blog, allowing it to help you continuously fill that sales funnel? 39% of b2b marketers in North America find blog posts to be valuable marketing content. Blogs are a great way to increase your digital presence, making you more visible and "findable" via Google, Bing and the like. They can also be a great way to generate leads. Your blog can function as a kind of triage for your sales team, fielding and answering questions organically via the content you produce there. However, it can perform that function only if you effectively create momentum with visitors who are likely to buy, turning them from mere passersby into something more. Here's a 10-step prescription to increase your visibility and attract more qualified folks to your site. It may not shoot cherry pits, but it will help you convert your traffic into leads. 1. Make your blog an extension of your main website. A visitor's first experience with your company might be through a blog page. He or she might never land on your main site's homepage, so link your blog visually (mirroring the navigation and design of your main site) as well as technically. Maintain the blog as a subdomain of your main domain (something like blog.website.com) versus putting it on a separate domain entirely. Blogging on the same domain that hosts your company site ensures that all inbound links to blog pages also juice up the search mojo of your main site. 2. Solve or share, don't shill. Your blog should focus on your customers. It should either solve their problems or share your resources. Don't shill your stuff. This may sound obvious, but too many business blogs seem to be a repository for press releases, regurgitated marketing-speak and other pablum. News about your company and its products and services might be fascinating to you, but it's not what will ultimately attract and engage prospects. Write about what they care about. 3. Show up. Half of blogging is consistency, or just showing up on a regular basis. (Naturally, the other half is producing great stuff!) You don't have to blog every day, but you do have to create a schedule that's sustainable for you. Hiring a freelancer or a staff writer or editor can help keep you on track with regular content, especially if you are a reluctant writer. But if you can't afford that, use an editorial calendar to plan a posting schedule (and stick to it). An editorial calendar, by the way, is simply that: a calendar on which you plan what post will be published when. Showing up also applies to the ongoing care and feeding of the community you're creating through your blog. Encourage conversation and engagement by responding to comments (even negative ones). Be part of the conversation, not above it. 4. Avoid War and Peace posts. The best blog posts are punchy and concise, focusing on a single idea. Think short paragraphs or bullet points. And don't bury the important information. Open with a declarative sentence that sets up the key idea. Framing blog posts this way not only respects your reader's busy schedule, but also helps address the anxiety a lot of us feel about writing. A blog post can also be a graphic, image, video or even an embedded PowerPoint presentation. An intriguing headline, or title, is also critical to attracting actual humans to read your post. The title of an article is not merely a promise to the reader (an idea of what's in store), it's also the pitchman for the entire post: It entices people to either click or … not. 6. Link to other resources. Throughout a post, link specific words or phrases to other resources on your site. You can link keywords to resource pages you've built around those words, or you can link to specific landing pages where you've posted related offers, like the ability for visitors to sign up for a companion webinar, request a white paper or get a free trial. 7. Embed companion calls to action. In addition to linking within the post itself, remember the real estate around the post. There are a few areas prime for calls to action on any blog page, including the "leaderboard" spot at the top of your blog, the sidebar on either side of the post and the often-ignored space immediately following a blog post. 9. Trick out with social bling. The more traffic you attract, the more opportunities you'll have for generating leads. So be sure to outfit your blog with social-sharing icons, particularly the big three: Facebook, Twitter and LinkedIn. Doing so subtly encourages your visitors to share your content and allows you to reach your network's network, which is a key attribute of social media. Of course, this assumes that you are actively participating in social media, i.e., engaging in conversation, and not just broadcasting headlines. 10. Remember one final thing. Fundamentally, a blog is an opportunity: It's a way to connect with customers in a real-time, accessible way. 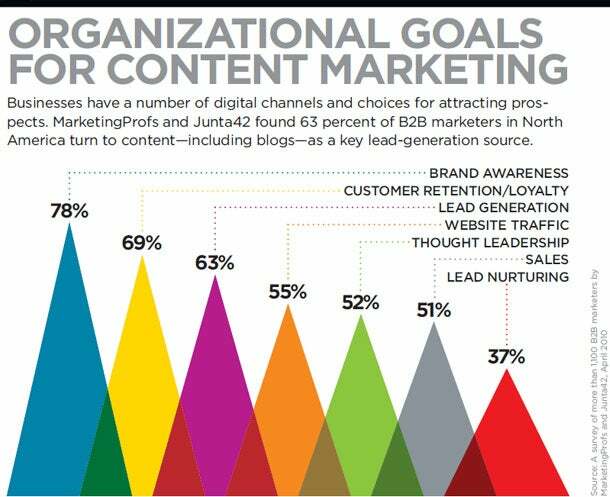 But your blog needs to be part of your business, and part of your lead-gen efforts. Talk it up in e-mail newsletters, in print collateral and on packaging materials. A blog won't magically drive business without active and ongoing promotion and participation--no matter how much inspiration Dr. Seuss imparts.